North Grosvenordale, CT- Stephen J. (Dixie) Dickson age 60 died Thursday, January 31, 2019 at the Univ. of MA Health Care Center Hospital, Worcester, MA He leaves his wife Kimberlie A (Machado) Dickson. He also leaves a son Ryan Beauregard of Webster, daughters; Jessica Dickson , Alysha Dickson and her companion Jacob Cotnoir and Jennifer Beauregard all of Webster. He also leaves a brother, Daniel Dickson of Thompson, CT, sister Cheryl Seymour of Oxford, Melissa Martin of Palmer and Linda Dickson of Southbridge, many aunts and uncles, nephews, nieces and cousins. 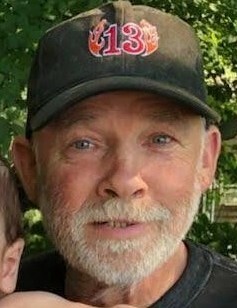 He was born in Webster son of the late Joseph Dickson and Marsha (Callahan) Dickson and lived in Thompson area for the past twenty years prior to that living in Oxford, MA. Dixie was a electrician who worked for Loos and Co. He was a life member of the Vigilantes MC of CT, the Bay State Rattlers, Thompson Rod and Gun Club. He enjoyed fishing, hunting and driving classic cars. A celebration of life will be held Friday, Feb. 8, 2019 at the North Grosvenordale, CT Knights of Columbus Hall from 4 PM- 8 PM with a service in the hall at 4 PM. Please omit flowers, donations may be made in his memory to TEEG, 15 Thatcher Rd, North Grosvenordale, CT 06255. The Shaw-Majercik Funeral Home, 48 School St., Webter, MA is directing arrangements. A guest book is available at www.shaw-majercik.com where you may post a condolence or light a candle.